Bouncer spotted at popular D.C. cupcake shop. The line for cupcakes at Georgetown Cupcake extends outside, and people wait in the chilly rain for their chance to enjoy the sweet goodness. We know the cupcakes are good. OK, delectable. But a bouncer? Really? Cupcake madness has reached new heights at Georgetown Cupcake on M Street. A bouncer is now posted outside the wildly popular and wildly busy bakery. He's there, presumably, to manage the lines that snake through the streets of Georgetown, not to guard the baking secrets of the sisters, Katherine Kallinis and Sophie LaMontagne, who own it. There's almost always a line outside (rain or shine), not to mention the crowds that form inside, as people cram to decide whether it's a red velvet, salted caramel, coconut kind of day -- or a vanilla birthday, chocolate ganache, key lime kind of day. 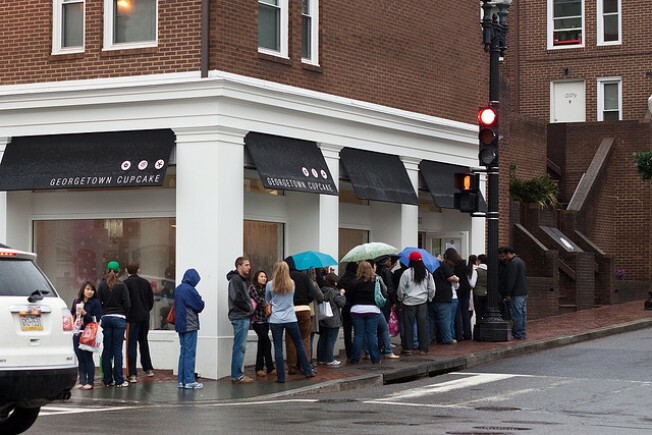 Even when Georgetown Cupcake operated out of a shoebox-sized storefront around the corner, people waited hours in line for the $2.75 cupcakes. As the store has grown since December, so have the lines. Maybe the new TLC reality show "D.C. Cupcakes" -- which revolves around the sisters and their gang-busters business -- helped to slather on the buzz. But Georgetown Cupcake diehards will tell you: The cupcakes are that good. The question for them is not why there's a bouncer out front. Instead, Georgetown Cupcake fans are asking whether he can be bribed.